I woke up early in the morning to find Elden outside on the veranda. I thought he was just taking advantage of the fact we were at the Kibbutz En Gev by the Sea of Galilee and he thought it would be nice to sleep outside. When I asked him, his look said otherwise. My wife is right, I do snore, and rather loudly. Just ask Elden. Before a breakfast of pomegranates, eggs, toast, coffee and juice, I was able to go down by the seashore, relax a bit and take some of the 1400 photos I brought back from our trip. The morning was overcast, so you couldn't see far, but it was possible to see to the other side. After breakfast Salim, our excellent bus driver, pulled up just outside our doors to make it easier for us to load our luggage. I can't say enough about his driving skills. If ever there were a bus driver who could get through a tight spot it would be Salim. He proved this many times during the course of the trip. Once on the bus our guide, Ellen, (who was still nursing her black eye) greeted us with all her normal enthusiasm. Ellen was a gifted storyteller and when she read from the Bible, (usually the story was close to or in the exact spot we were at) she had the ability to make it come alive. Ellen would normally start our mornings by reading us the psalm of the day. Today it was Psalm 48. How fortunate we were to have Ellen as a guide on our trip, and to have our heavenly Father as our guide even to the end. The Sea of Galilee is not as big as I thought it would be, but it did surpass my expectations as far as scenery and serenity. The Sea of Galilee turned out to be one of my favorite places. As we drove around the Sea of Galilee to our first stop, Tiberias, it was very easy to picture Jesus teaching and ministering to the people. On a hill above the sea is where Jesus taught the Sermon on the Mount. I would have loved to have been there. It is also where he picked a few of his fishermen disciples. We crossed the Jordan River as it exited the Sea of Galilee. As we came into Tiberias, it looked as if there was an active dig going on. However, the area where we stopped appeared to be abandoned except for a pack of dogs that didn't seem pleased to see us. I was surprised that no one was watching or guarding the sites. But, if you think about it, if you wanted to guard all the important archaeological sites in Israel, you would have to have a guard every ten feet, because almost everywhere you dig is a potential site. 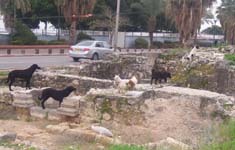 At Tiberias we saw the remains of some homes, a bath house, and jail cells, which led some to believe it could have been a court house. Tiberias was a strong Jewish center after the second Jewish revolt and the fall of Jerusalem. The Sanhedrin moved from the city of Sepphoris to Tiberias in A.D. 150, and subsequently established their schools of rabbinic study there. 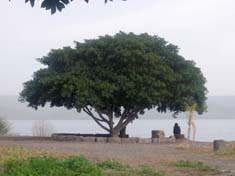 The Talmud was developed at Tiberias. Across from the archeological site was a park or recreational area with boats. 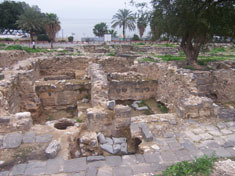 Tiberias is also known for its natural hot springs. From Tiberias we followed the Jordan River south to Beth Shean. Like most of the ruins we visited, there were many levels of occupation uncovered at Beth Shean. They extend from the fifth millennium B.C. to the early Arab period. As we entered the site, we had a panoramic view of the excavated ruins. We immediately felt as if we were in an ancient Roman city. Elden and Gordon climbed the tel to an even higher spot, which overlooked the Jordan and Jezreel Valleys. Located at this key intersection, Beth Shan was an important city. On top of the tel we could see the tree that was used in the movie Jesus Christ Superstar to depict Judas hanging himself. 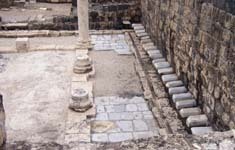 Beth Shan of Jesus' time, one of the cities of the decapolis and then named Scythopolis, was developed around two colonnaded avenues lined with shops, impressive public buildings, and special monuments. As we walked down these same streets you could still see the ruts created by the chariots. Excavations revealed remains of a massive temple on a piazza where these roads converged. The temple may have been dedicated to either Dionysus (god of wine) or to Tyche (goddess of fortune). The inhabitants of this city were indeed fortuitous. They had exercise areas, hot baths, and steam rooms. It was very ingenious how they built them. Fires outside would heat the water into steam, which was then blown by bellows through pipes under the floors, and into the rooms for the people to enjoy. One area of ruins we looked into, had a wall with about 10 sets of small rock slabs set side by side about a foot a part. Underneath the slabs was a drainage ditch or trough. Yep, you guessed it! A photo-op at the community outhouse. There is also a gorgeous outdoor theater with seating for 8000 people. They had sidewalks with running water and a storm sewer system. More than at any other city, I felt that this one was a place of great wealth. Unfortunately an earthquake devastated the city in A.D. 749. Then it was utterly destroyed by the Crusaders. Teams of archeologists are now restoring the city to its former splendor. We will have to come back and visit when they are done. We stopped for our falafel lunch at a combination gas station, fast food restaurant and market place. As we were eating, a storm rolled through with some lightning and thunder. I remember thinking that the thunder sounded like artillery shells or bombs going off. It rained some but not enough to keep me from buying some chocolate covered dates, which, by the way, were delicious. I did not share those on the bus. My apologies. 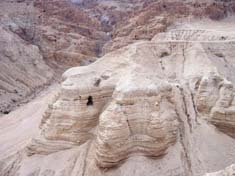 Our next stop was Qumran, near where a shepherd boy found the Dead Sea Scrolls in 1947. I remember it being a beautiful area. I guess I must like rocks. The rock formations were stunning, and we did not have to go in the caves. Yahoo!! Later on in our trip we were able to see the actual Dead Sea scrolls at the Israel Museum. Next it was the Dead Sea swimming or should I say floating. It was a hoot. The water was a little cold, it being February, but most of the crew braved the elements and donned their trunks for a dip. Gordon had his photo taken reading a magazine while floating. Some of us slathered Dead Sea mud all over our bodies, let it dry and then washed it off. It made your skin feel extremely soft. They say it is because of all the minerals. This was a very popular area, one of the busier places we visited. It is the lowest spot on the earth and pollen free. After arriving at Kibbutz Kalia, next door to Qumran, we found out just how severe the storm had been. Our companion group, traveling with Randy Smith, was unable to travel further down the road because of a wash-out. They had to take a lengthy detour, which took much of the night. We later found out that a prominent New York cantor had drowned after being caught up in the flash flood. After another excellent buffet dinner, Elden and I joined Linda in her search for Doug, who had decided to tour the kibbutz dairy with their only room key. Once we were in our rooms, it was a little reading and then lights out early to get ready for another exciting day in Israel.